Annuals offer instant color with the changing seasons while Perennials are tried and true from year to year. Your best look is accomplished by combining both in your garden and beds. Jump & Jive - Popular choice for shady gardens, where they perform well if given a rich, moist soil and regular watering. This compact selection has fluffy plumes in a bright magenta-pink or purple-red shade, over a mound of elegant, lacy green leaves. Great near the border edge, also thrives in tubs, or mixed containers. 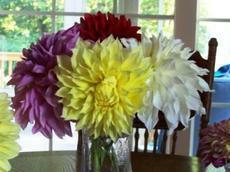 Large flower heads, 14-18 inches tall, 16-18 inch spread. Radius - Outstanding plant forms a large, robust clump with loads of green foliage turning to a reddish copper cast in springtime. Leafy, burgundy red scapes carry triangular plumes of burgundy red buds which open to bright red flowers in early to mid summer. 20-26 inches tall, 24 inch spread. Light green leaves with wide, irregular, creamy yellow margins. An extraordinary specimen being offered by English Country Gardens. Strikingly beautiful, especially when planted en masse. 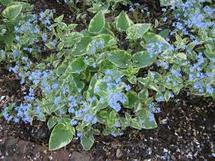 Produces tiny, baby blue, forget-me-not like flowers which are borne in panicles above the foliage from mid to late spring. Treasured for its shade tolerance and lovely blooms, Makes a fantastic ground cover, though this variegated form may slow to spread. Blooms are perfect for additions to your spring bouquet. 12-15 inches tall and 12-15 inches wide. 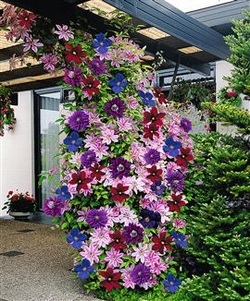 If you are looking for a great climbing perennial, reach for Clematis. Available in an assortment of flower sizes, shapes, and colors. Clematis prefer full sun but like to keep their roots cool, so place it in a bright sunny spot and use mulch or low shrubs as a cover to keep the roots cool. 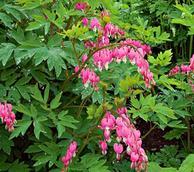 A tender perennial - Bleeding heart is a sprawling vine like shrub with evergreen leaves. The plant's stems can get 15 ft (5 m) long, climbing without tendrils, suckers or root hairs, but rather by twining through and around its support. The leaves are large, up to 7 inches long, and arranged opposite one another along the stems. Panicles 4 inches across. 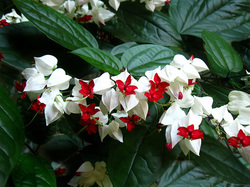 Red and white flowers are produced throughout summer. The individual flowers, a half inch wide, are bell shaped with white calyces and crimson red petals. As is typical of the glorybowers, the flowers have four stamens and a style (the elongated part of the pistil) that extends way beyond the petals. Abundant eye-catching, brilliantly red, tubular flowers appear in mid-summer atop bold, slightly arching, sparsely branched 3-foot-tall stems. 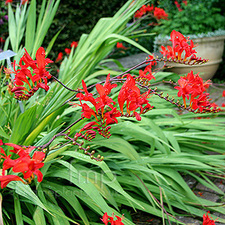 Crocosmia's mid-green leaves are pleated and swordlike. Thrives in a warm, south-facing location. Plants require well-drained soil. After the first year you can lift and divide clumps in spring to maintain vigor. These long flower stems make wonderful additions to your cut flower garden. Repeat bloomers, you'll enjoy these beauties from mid summer through fall. Kelvin - The yellow Kelvin Floodlight pictured here really is as large as it appears. Known as the giant "dinner plate" sports blooms 6-8 inches across in a wonderful rich sunshine yellow to brighten any garden. 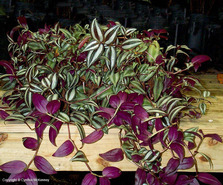 Grows well in full sun to part shade with stems of 32 inches and up. Cambridge - another of the "dinner plate" sized flowers. This one is buttery-yellow splashed with flecks of red. Extra-long, slightly cupped petals give this flower a contemporary look. Very popular cut flower. Blooms up to 8" across about 40 inches tall. Park Princes - tightly rolled blushing pink petals vary in color from pale to rich vibrant pink. 24 inches to 32 inches and up tall. Vancouver - like a sparkling edge of frost in the heat of summer, the white borders of this dahlia's petals highlight the vibrant fuchsia violet blooms on this newer dinner plate dahlia. Tall, with flowers that often span 8-10", Vancouver shines in the back of the border or in a vase where just three big blooms are all that's needed. The old-fashioned Bleeding Heart has been a garden favorite for years. It bears long arching racemes of heart-shaped pink flowers. Blooms start in mid April to Mid May and last several weeks subsiding with the arrival of summer heat. Plants often go dormant in mid-summer. Interplant with ferns and hostas to fill the breach. In our area these plants LOVE the part shade garden. What an adaptive plant. You can plop this beauty, pot and all, right down in your water feature - just put some rocks on the top of the soil to hold it in the pot; plant it in your garden as an accent plant; or any where in between. 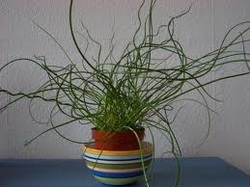 We call it our Bad Hair Day Plant and it has been a favorite gift for hair dressers. Grows to about 12 - 18 inches tall and has a spread of about 1 - 2 feet. The mound will increase every year. Mine have frozen solid in our water feature several years in a row - so there is no need to be afraid of leaving it out in the cold. 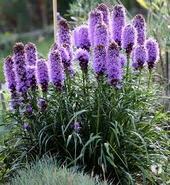 Liatris Spicata grows easily in average, medium, well-drained soils in full sun. Somewhat tolerant of poor soils, but perfers moist, fertile ones and generally performs better in moist soils than most other species of Liatris. Intolerant of wet soils in winter. Tolerant of summer heat and humidity. 2 - 4 feet tall with a spread of 3/4 - 1 1/2 feet. Very showy flowers on tall flower spikes. 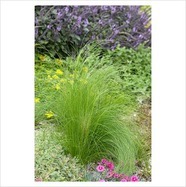 Pony Tail Stipa - Also called Mexican Feather Grass.Attractive grass featuring finely clumps from 18 inches tall with an equal spread. Drought tolerant, must have well-drained soil. Use as accent plants or in mass plantings. Perfect for dry slopes. Attractive in containers. Fall seed heads start off buff but change to golden-bronze.Cut back to 6 inches in late winter. 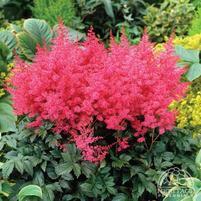 A lovely heat tolerant plant with tall flower heads showing great color in a variety of shades. You are bound to find a variety that fits your garden. Eesie's Gold - colorful golden yellow variegated foliage fades to a soft cream by autumn. The star shaped flowers open soft shell pink ageing to deep saturated pink. Elsie's Gold is winter hardy. Long blooming period from summer to fall. Drought tolerant once established. With our varieties of sedum you will find a good choice for your garden bed. Homestead Purple is a true Perennial - Vigorously spreading, deep purple clusters from June to November. Excellent clean, deep green foliage with a trailing habit.10 - 12 inches tall, with a spread of 18 inches. Verbena makes an excellent ground cover and works well in window boxes, pots, containers, and hanging baskets. If you love blue, you'll love Veronica. It sports some of the clearest, truest blues in the perennial border. other flower colors are also available. 1 - 3 feet tall mounts, narrow spikes of tiny flowers superb in bouquets. Tender Perennial - A lovely plant well suited for containers and hanging baskets. 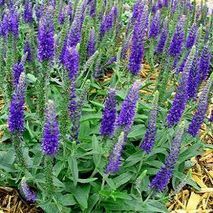 A tender perennial featuring bi color on the top of the leaf and a rich purple underside. This plant is coveted for the foliage but does produce small insignificant flowers.